1080p Upscaling When played in this system, your DVDs will upscale to near 1080p quality. Multi-format disc playback View a wide variety of movies, videos, and photo formats including DVD, MPEG4, and JPEG. Listen to a wide variety of music formats, including CD and unsecured MP3, WMA and AAC. USB Port Allows for easy, convenient enjoyment of movies, videos, photos and music listening from a USB device. BRAVIA Sync Control all your Sony BRAVIA Sync enabled devices with one remote control when connected to this system. Enhanced Connectivity In addition to HDMI, Composite video output is included for connection to older television set. Audio Input (Analog) allows you to easily connect MP3 players and other audio sources in your system. Allows for easy, convenient enjoyment of movies, videos, photos and music listening from a USB device. 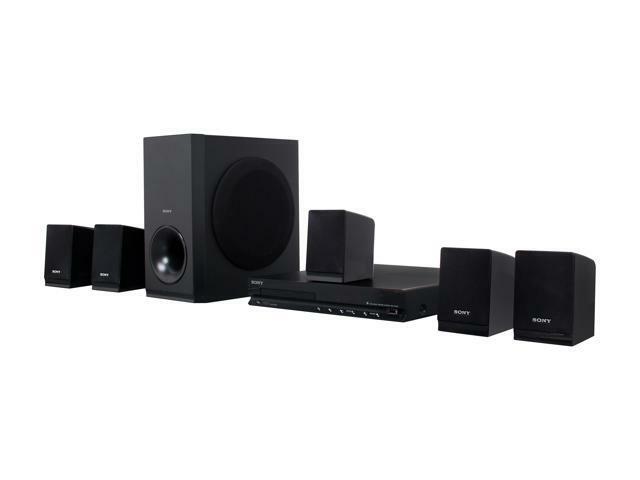 Control all your Sony BRAVIA® Sync enabled devices with one remote control when connected to this system. Audio inputs allow you to easily connect MP3 players and other audio sources in your system. Connect to your older television set with composite video output. Sends a near-HD quality video signal to your HDMI-enabled television. Other Thoughts: RETURNED QUICKLEY, WAITING FOR REFUND ! Pros: This system is an excellent value for those in the DVD market. It's easy to set up, functions well, etc. Cons: Having said the pros, as someone else noted, the max volume is not that loud. Pros: my lil cousin loves it I bought it for him. Pros: c'est le meilleur que j'ai pu mettre ensemble sans problème le son est super. Connectivité améliorée En plus de HDMI. Pros: Looks and works pretty good for being a refurbished system. Pretty easy to set up. Cons: The only two things that bugs me are I can't manually change the amount of sound that comes out of the subwoofer and surround speakers and the surround speaker wires aren't very long. Pros: Powerful, great sound. Hooked up to my PC since I watch everything online anyway. Playing PC games with this system sounds awesome and the price was good. No complaints. Pros: Cheap and it works great.